Always wanted to play music, but never had the time to learn an instrument? Or do you simply want to create music on a whim but you don’t have instruments at your disposal? Richard Lawler’s new music app for the iPhone, PatternMusic, is the perfect app for someone with a casual interest in creating music. It fills a need between tools that create random sounds (think Air) and more complex tools (like JR Hexatone Pro). It offers a good selection of different instrument sounds which you can use to create original songs. Users can also play polyphonic musical instruments with over 50 different voices to choose from. And don’t worry about losing your place while listening to music. With this app, you can listen without closing your iPod library. The starting page features The Stage, where you mix and arrange your songs. The different icons on the stage are different instruments–the designs are artistic representations that vaguely resemble the actual instrument. So how do you use it? When you drag and drop the instrument icons, you increase the volume in your song. If you drag the icon more to the left or more to the right, the sound will shift towards the respective stereo channel. The instruments don’t sound like real instruments and they are more like short blips. But the stage is easy to use, and it takes little effort to add, delete, or duplicate the different instruments. If you double tap on an instrument, the Mult-Touch Pattern Editor opens up. From there, you can create infinite or counted looping; scroll left-to-right along the timeline and select from 64 different notes (per pattern); and scroll up-and-down through a 4 octave range for the instrument. You’ll press different buttons to set notes and create a repeating pattern for your song. The more instruments you add, the more complex the song becomes. 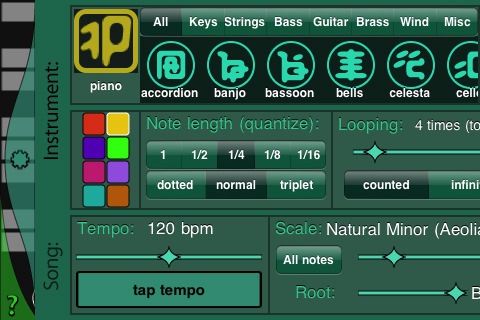 PatternMusic also allows you to change tempo, scale, time signature, dynamics, and note length (anything from 1 to 1/16 and dotted, normal, or triplet). You can also automatically change your octaves. Users with larger fingers will appreciate the zoom capability. Users will enjoy the easy to use format and the sharp looking graphics PatternMusic offers. There is also a handy dandy built-in help feature and tutorial for anyone who gets lost. The learning curve is pretty smooth, and it’s easy to use once you become acquainted with all the features. Users can also access online video tutorials without leaving the app. For those who want additional help, visit www.patternmusic.com. Other great features include auto-save: your last session will automatically save when you quit or you answer a phone call and it’s ready upon your return. Sadly though PatternMusic lacks the ability to export your songs, which will hopefully be added with future releases. Users who want a more advanced app to create even more complex songs and different looping/mixing features should look at the JR Hexatone Pro which retails for $9.99. It has a steeper learning curve but it comes with export capability. But for the casual user or the musician who just wants to play around, PatternMusic is definitely worth looking into. You can create different loops on-to-go and have lots of fun experimenting. For the limited time offer of $1.99 at the iTunes store, this app is a good buy. AppSafari review of PatternMusic was written by Linda Ta on March 15th, 2010 and categorized under App Store, Fun, Games, Music, Utilities. Page viewed 3273 times, 1 so far today. Need help on using these apps? Please read the Help Page.